There was never going to be a Cabinet announcement in the press conference after the ANC’s national executive committee meeting on Sunday – President Cyril Ramaphosa is much too aware of the separation between party and state to allow that. But the party’s latest deployments give a clue as to the shake-up Ramaphosa is expected to announce this week. One surprise is that it puts National Assembly Speaker Baleka Mbete right in line to become deputy president – or will it be ANC deputy president David Mabuza? By CARIEN DU PLESSIS. As the weekend started, a speculative story appeared on the Mail & Guardian website regarding who would be given which tasks in the ANC’s national executive committee. There’s some comfort in the fact that much of the story was true, at least as far as some of the positions within the party are concerned. This shows a measure of predictability could be returning to political appointments in the ANC (at least for now), which points to consultation taking place, as well as the fact that we’ll be spared the surprises of the relatively obscure executive appointments of the Jacob Zuma years. Think Des van Rooyen, David Mahlobo, Bongani Bongo, Mosebenzi Zwane. ANC insiders reckon President Cyril Ramaphosa will delay the reshuffle (of a Cabinet slimmed down from 35 portfolios to a rumoured 25) until just after Wednesday’s Cabinet meeting, to give ministers a chance to say goodbye. This will also show that he’s measured, and careful not to humiliate anyone. Of course, this information could also be wrong, as many insiders expected Ramaphosa to do the reshuffle a weekend ago already, shortly after he took over as Number One, and then the expectations were moved forward to Thursday, to allow Malusi Gigaba to deliver at least one Budget Speech as finance minister. If Ramaphosa wishes to get on with the business of government, however, he probably knowa that he needs to shuffle sooner rather than later, at least so that the ANC would have something to show to lure the urbanites and middle classes back to the polls in next year’s general elections. The Mail & Guardian speculated that former KwaZulu-Natal premier Senzo Mchunu – him who lost out to ANC secretary general Ace Magashule in December by two dozen votes – was pushed by Ramaphosa’s supporters to head the party’s organising and campaigns, while Dakota Legoete, North West provincial secretary but elected as NEC member in December, was Magashule’s first choice. As it happened, they both got it and will be working full-time from Magashule’s office to ensure that the ANC win the elections – Mchunu as chairperson and Legoete as deputy chair (this division of roles wasn’t clear in Magashule’s rendition during the press conference on Sunday, but is reflected on the party’s statement). This rules them out from possible Cabinet positions (Mchunu has featured on a number of speculative lists) because they would be working at the ANC’s Luthuli House headquarters full time. This is also in line with a conference resolution (resolutions are expected to be released formally soon as the NEC had to do some “language” checks first) that there should be a limit on the number of NEC members who also serve in Cabinet – and that the party should have more full-time staff. Magashule said 50% maximum, which is revised down from the 65% the policy discussion document from last year prescribed. Another correct prediction was the deployment of former party spokesperson Zizi Kodwa into the office of the ANC president. He was there about a decade before, when he still had enthusiasm for former president Jacob Zuma. Counter to the prediction that ANC presidential wannabe Nkosazana Dlamini-Zuma would be responsible for monitoring and evaluation, Kodwa himself is responsible for this. Magashule told journalists in Sunday evening’s press conference, straight after the NEC meeting, that Kodwa was in charge because “we decided we need to be evaluating the resolutions of congress, we need to be monitoring cadres and service delivery, making sure that all of us will be working together to deliver quality services”. This is a different position to the monitoring and evaluation portfolio in Cabinet, which is government- rather than party-focused. Dlamini-Zuma will be heading the party’s education, health, science and technology subcommittee, which may put her in line for a Cabinet position in one of these fields – or this is a way of freeing her up to do something altogether different. Looking at National Assembly Speaker Baleka Mbete’s deployment, reports about Dlamini-Zuma not getting the deputy presidency are likely to prove correct. After a weekend of frantic speculation that Mpumalanga premier and ANC deputy president David Mabuza is the latest in line for the deputy presidency – confidential sources would even have it that he was put on Mpumalanga’s list to Parliament to be sworn in as soon as possible this week – Mbete was the one named to head the party’s political committee. As Speaker, who isn’t supposed to get too involved in party politics, it would be slightly unusual for her to occupy this position, but also not impossible. Ramaphosa was chair of this committee when he was deputy president, and the brief of this committee, according to the ANC’s parliamentary caucus website is to be “responsible for the overall political guidance” of the party caucus and the office of the chief whip. Could it therefore be that Mbete, who was the first to congratulate Ramaphosa with effusive kisses on his election as president in Parliament 11 days ago, will be deputy president again, like she was in former (caretaker) president Kgalema Motlanthe’s Cabinet? Or will she continue to straddle between party and Parliament, as she did formerly as ANC chairperson? 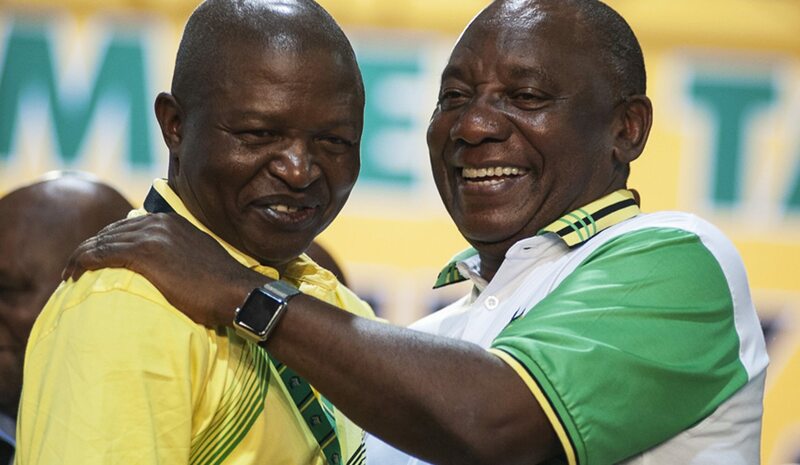 Or is Mabuza’s appointment as head of the deployment committee, an important position also previously occupied by Ramaphosa, an indication that he will, in fact, be the one to be announced deputy president this week? There is an argument that Mabuza should only move into the country’s deputy presidency after next year’s general elections to allow him a chance to wrap up his provincial work and get settled in as ANC deputy president. Many in the party are also, however, saying that it would only be correct for the party’s deputy president to be the country’s deputy president. Appointing Mabuza would, however, reflect really badly on Ramaphosa’s commitment to the gender issue, and Dlamini-Zuma’s campaigners would wag their fingers at him and say “we told you so”. A possible solution suggested on a Cabinet lobbying list that’s been doing the rounds this weekend, is to have two deputy presidents to settle this issue. The Constitution in its current form, however, only suggests one deputy president, and changing this would require a two-thirds majority vote in Parliament and an amendment act, which could take a while. One of the notable absences from these deployments is ANC chairperson Gwede Mantashe, who was previously rumoured to be wanting to go to the National Assembly as Speaker – or who might just have decided that living on his farm in the Eastern Cape is what he wants to do full-time after all. The full list of the ANC’s new appointments is below. Being chairperson of a committee may or may not indicate that that NEC member is destined for a ministry, as these in the past have sometimes but not necessarily corresponded to ministries (international relations, for example, generally always has a different head in the party than in government because the party’s activism is not always in line with the diplomacy required in a ministerial portfolio).